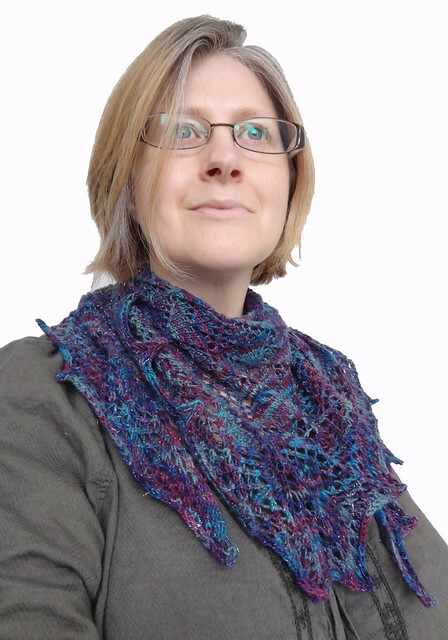 I just realised that I didn't tell you about a little shawlette I made before Christmas. It got missed out in my big disappearing blogger act. 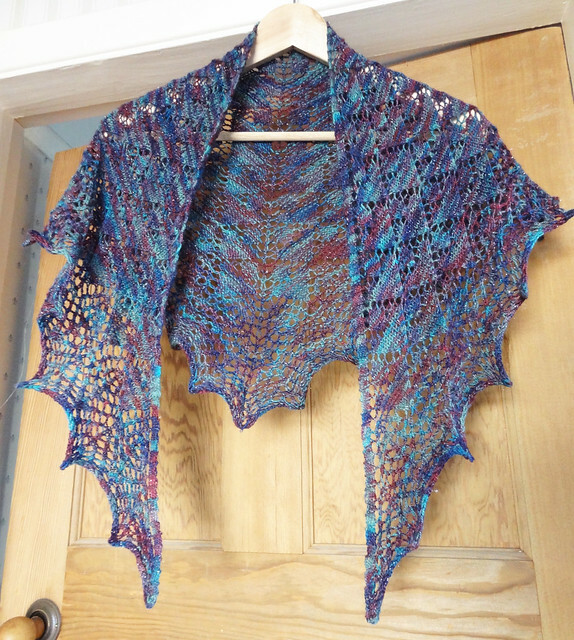 The shawlette is a pattern you have seen before, my own design, Refraction Shawlette. 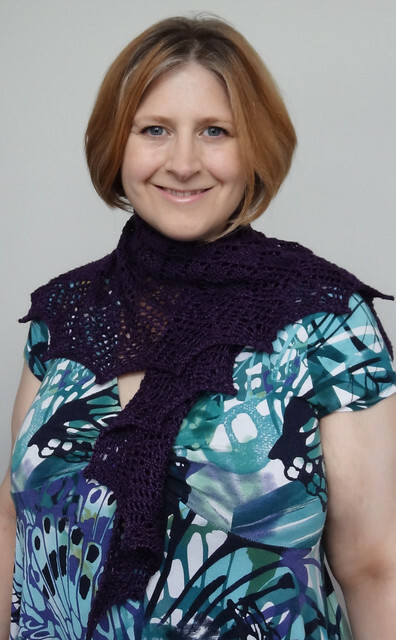 I decided to knit another version of this shawl because I gave the purple Fyberspates Scrumptious sample I made, whilst testing the pattern, to my sister-in-law for Christmas, because I knew she would adore it. I have lots of purple shawlettes, she needed it more than me. I was prompted to make the pattern again when I bought a special skein of yarn from Posh Yarn, Pamela Sock in the "I'll Get You My Pretty" colourway. It contained all my favourite colours AND it had sparkle too. How am I supposed to resist such glory? Purple, pink and teal - it is pretty much my ideal blend of colours. As soon as I got the skein of yarn, I had to cast it on. I decided that it would be a good opportunity for me to try my pattern in a variegated yarn. I decided that even if it hid the lace I wouldn't care because the colours were so nice. Despite my worries, I was delighted with the results. As the first lace section has quite large stocking stitch portions, the yarn gets a chance to shine, without the lace getting lost. 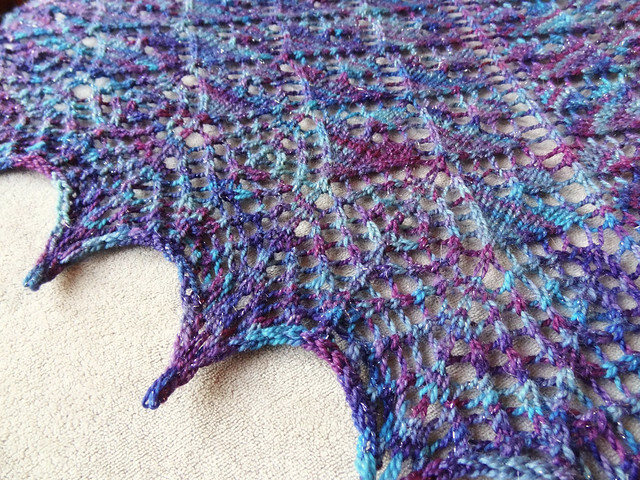 The bottom lace section gives creates little sections of knitting that cause the lovely colours to "pop". I couldn't be more delighted with the results of this pairing. 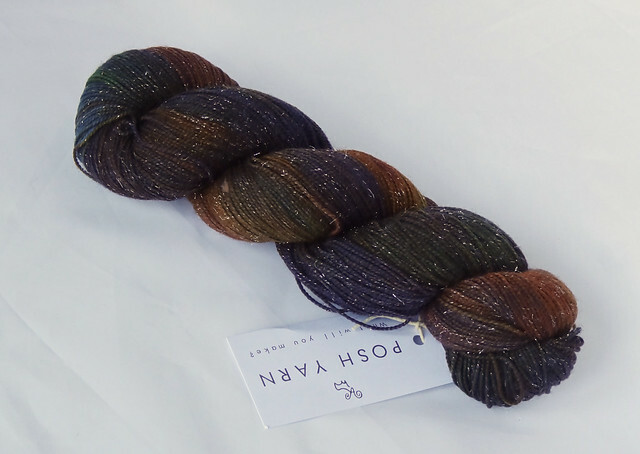 The yarn is a true sock yarn as it is comprised of 75% merino/20% nylon/5% other(sparkles). I think it will be hard wearing, and I would be happy to use it for socks, but it is still soft enough to wear next to my skin. I have been wearing it a lot. It's a lovely bright accent of colour that keeps my upper torso warm and it I'm so happy I tried this experiment. 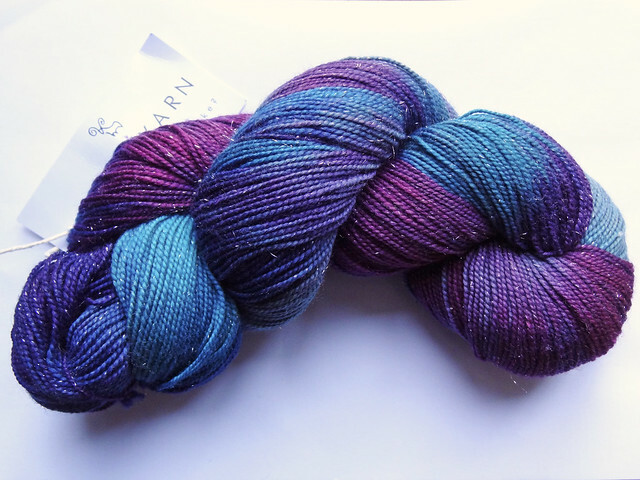 I have to confess, I liked it so much, I might have bought another skein of this yarn, in a different colour, "The Door Just Opened For Someone". I wonder what I'll do with this one. By the way, did you know Episode 10 of the podcast is now live? As I have a finished object, on a Friday for once, I shall link up with Tami for the first time in ages.